This entry-level managed switch provides 20 Gbps wire-speed switching performance across all 10 ports. This enables the switch to fully support existing high-performance PCs and laptops, which significantly improves application response times and the speed of large file transfers. The two Gigabit Ethernet 100/1000BASE-X SFP slots provide uplink flexibility, offering extended fiber connections to the network backbone. VLAN features support flexible network partition and configuration, performance improvement, and cost savings. IEEE 802.1Q-in-Q VLAN tags expand the VLAN space by double-tagging packets. IGMP snooping prevents flooding of IP multicast traffic and limits bandwidth-intensive video traffic to only the subscribers. Storm control monitors the amount of storm traffic that is sent each second on an interface. It allows the administrator to specify how much storm traffic can be sent as a percentage of the total bandwidth of an interface. physical links together as a logical trunk and providing load balancing and fault tolerance for uplink connections. Support for eight egress queues per port enable differentiated management of up to eight traffic types. Traffic is prioritized according to 802.1p, DSCP, IP precedence, and TCP/UDP port number, giving optimal performance to real-time applications such as voice and video. access to the network. User authentication is carried out using a standard-based RADIUS server, with support for dynamic VLAN assignment. An embedded user-friendly web interface helps users quickly and simply configure switches. SNMP v1/v2 is supported for management by a network management station. The switch supports management functions over both IPv4 and IPv6. Cable diagnostics identifies cable faults (such as short, open, etc.) and feeds back a distance to the fault. LLDP (Link Layer Discovery Protocol) enables administrators to monitor devices attached to switch ports. 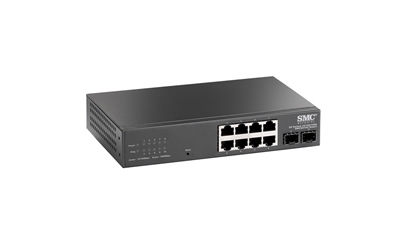 SMC Network's EZ Switch 10/100/1000 SMCGS10C-Smart is a 10-port Gigabit Ethernet switch providing 8 Gigabit ports and 2 100/1000BASE-X SFP uplink slots. This web-managed smart switch provides 20 Gbps wire-speed switching performance across all 10 ports. This enables the switch to fully support existing high-performance PCs and laptops, which significantly improves application response times and the speed of large file transfers. The switch supports a flexible web-based management interface as well as SNMP for both IPv4 and IPv6. The new SMCGS10C-Smart provides a range of feature-rich functions, including VLANs, Spanning Tree, link aggregation, multicast filtering, security, storm control, and QoS with 8 priority queues. Ideal for users looking to migrate from unmanaged to managed networks, this switch is easy to install and perfect for SMB and SOHO applications.